RAM TOUGH-BOX VERTICAL RADIO RACK 9" RAM MOUNT PRODUCTS HAVE A 10-12 WEEK LEAD TIME. RAM TOUGH-BOX VERTICAL RADIO RACK 13" RAM MOUNT PRODUCTS HAVE A 10-12 WEEK LEAD TIME. RAM TOUGH-BOX 29" LONG TOP PLATE RAM MOUNT PRODUCTS HAVE A 10-12 WEEK LEAD TIME. 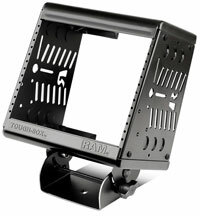 RAM TOUGH-BOX 23" LONG TOP PLATE RAM MOUNT PRODUCTS HAVE A 10-12 WEEK LEAD TIME. CONSOLE LEG KIT CHEVY GMC SUBURBAN TAHOE RAM MOUNT PRODUCTS HAVE A 10-12 WEEK LEAD TIME. CONSOLE LEG KIT DODGE CHARGER, MAGNUM RAM MOUNT PRODUCTS HAVE A 10-12 WEEK LEAD TIME. CONSOLE LEG KIT FORD EXCURSION, F250-750 RAM MOUNT PRODUCTS HAVE A 10-12 WEEK LEAD TIME. CONSOLE LEG KIT 2006 CHEVY IMPALA RAM MOUNT PRODUCTS HAVE A 10-12 WEEK LEAD TIME. CONSOLE LEG KIT FORD F-150 2004- RAM MOUNT PRODUCTS HAVE A 10-12 WEEK LEAD TIME. CONSOLE LEG KIT CHEVY IMPALA 2006-2008 RAM MOUNT PRODUCTS HAVE A 10-12 WEEK LEAD TIME. UNIVERSAL CONSOLE LEG KIT BUCKET SEATS RAM MOUNT PRODUCTS HAVE A 10-12 WEEK LEAD TIME. CONSOLE LEG KIT CHEVY 1500, 2500, 3500 RAM MOUNT PRODUCTS HAVE A 10-12 WEEK LEAD TIME. CONSOLE LEG KIT FORD F150, F250 EXPEDIT RAM MOUNT PRODUCTS HAVE A 10-12 WEEK LEAD TIME. CONSOLE LEG KIT FORD CROWN VIC 1991- RAM MOUNT PRODUCTS HAVE A 10-12 WEEK LEAD TIME. RAM TOUGH-BOX VEHICLE CONSOLE 9" LONG RAM MOUNT PRODUCTS HAVE A 10-12 WEEK LEAD TIME.